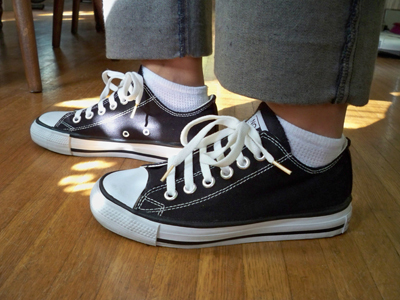 I love Chuck Taylors, but when I read about No Sweat sneakers on Natural/Artificial blog I was interested. No Sweat provides a competitively priced fairly traded product to consumers and a living wage to their workers. I told Aaron about them, hinting that they would be a great Christmas idea. He surprised me with them last week instead. The sneakers come with info on the wages and benefits of the workers that produce the sneakers. And the sneaks are pretty darn cute. Very cool-- but at first I was thinking, awesome, finally, my shoes won't stink anymore! Doh. Boo, most sizes are sold out. Those are hip. Thanks for sharing about this brand. i was so annoyed when the last chuck taylor plant in the US shut down!!! i'm really excited about these. the ankles look like they are a little higher than chuck's, is that true? my ankle bones are low and i have problems with blisters if the ankle opening is too high. anonymous - ew, I don't know. I would have to compare them side by side. They didn't seem higher when I wore them.